NABS employs NAATI accredited interpreters at Paraprofessional (formerly level 2) and Professional Interpreter (formerly level 3) levels and Deaf Interpreters who have either satisfied the criteria of the NABS/ASLIA DI testing process and/or have certification via a state based DI training program. 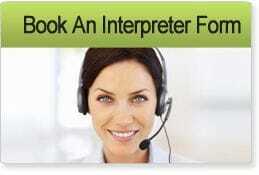 It is expected that interpreters will have some experience/skills in interpreting in health and medical situations. NABS provides ongoing professional development and training in medical terminology and medical settings. Professional Development for Interpreters is fundamental to the industry. NABS constantly negotiates funding as part of its service agreement to provide free or minimal cost continuing education opportunities for both NAATI accredited Auslan Interpreters and future Auslan Interpreters. WIth consideration to the difficulties of access, NABS is at the forefront of providing continuing education opportunities to regional and rural Interpreters through NABS professional development DVDs.